If it wasn’t for a road name there would be nothing left to show where Ffynnon Fair (St Mary’s Well) at Llanfair-is-gaer once stood. Written records of this spring can be traced back as far as an estate deed of 1458 which refers to a field named Cae Uwchyffordd alias Cae Ffynnon Fair, but this counts for nothing to most drivers today who speed past this site close beside the road between Bangor and Caernarfon. It is only the road that leads from the main road up to Bethel that still provides a reminder of the name, and although there are no name signs on the roadside Lon Ffynnon Fair, still appears on the maps. It was a long held local custom for residents of Bethel to spend time at the beach by Llanfair-is-gaer. On the way they would collect crystal clear water from Ffynnon Fair, then light a fire at the beach to make tea. He also noted that it was an old custom for the singers at Llanfair church to call at the well to drink on their way home, and to leave a note there for others ready for the next service. 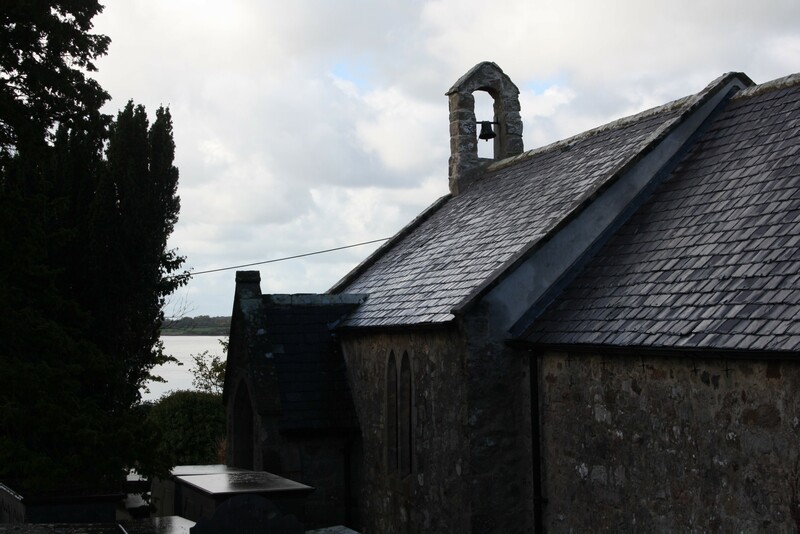 The church, also dedicated to St Mary, stands on the banks of the Menai Strait around about a quarter of a mile to the north of the well. Though largely a medieval structure with walls thought to date to the 13th century, it was largely restored in 1865. As is usually the case, it was securely locked and we were unable to obtain access inside. It had four walls, three low walls and a fourth even lower. There was a simple roof over it and a steel door was placed at the mouth of the well. This aroused the ire of the residents. 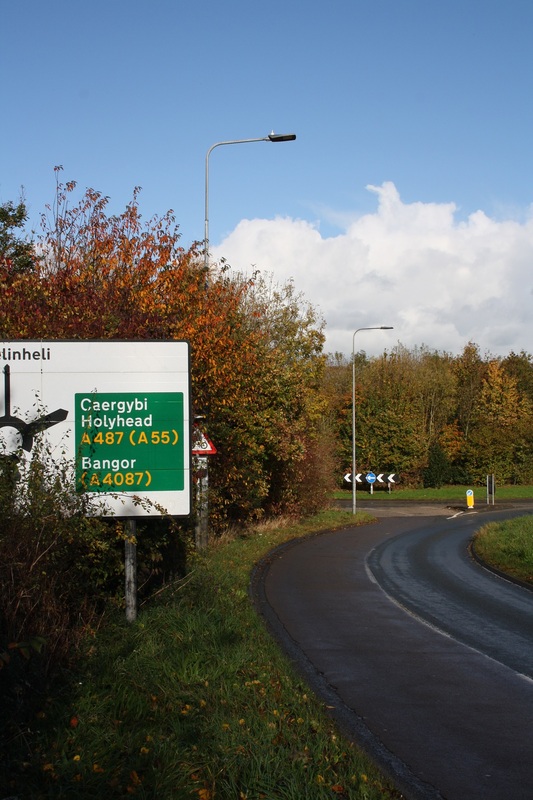 The final transport related incident to befall the spring was the construction of the A487 Y Felinheli bypass in the 1990s. The old railway line was the perfect route and the roundabout junction for Llanfair and Bethel was situated virtually on top of the old well. 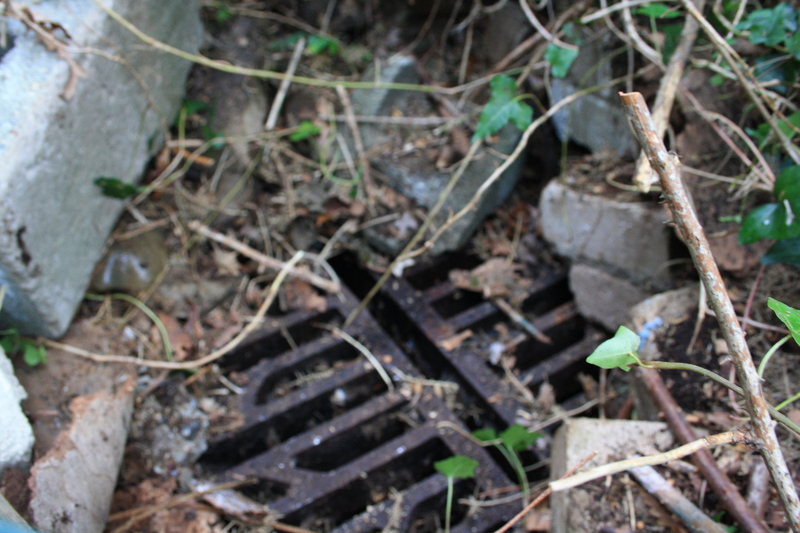 As we have seen previously at Ffynnon Farchell in Denbigh when it comes to a fight between a bypass and a well, the well inevitably comes off worse. Enclosed in a concrete sump and access denied by a heavy iron grid. The water rises and falls according to rainfall, but for the most part looks stagnant and unappealing. It would appear that the spring water is incorporated with the highway drainage at some point. Huws notes that the ground to the east of the sump remains marshy although concludes that this is probably runoff rather than being derived from the spring. In the 20 years that have passed since Huws’ visit the spring has fared little better. 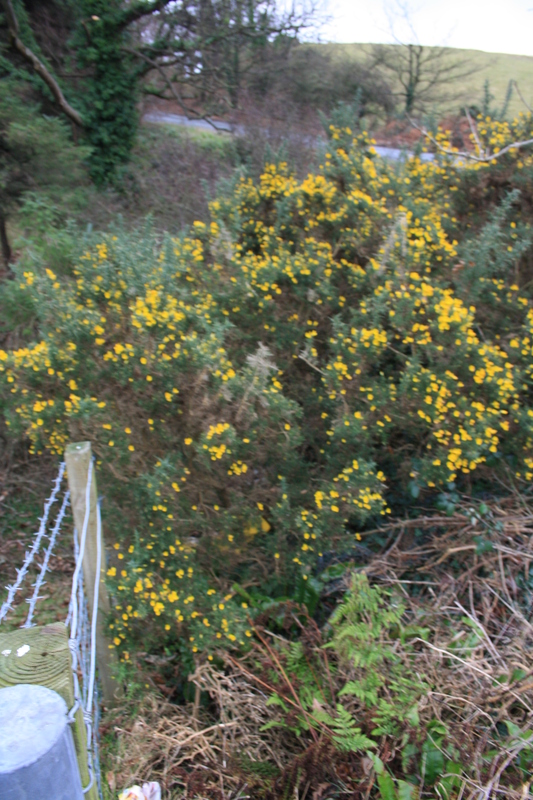 The area between the fence and the foot of the slope has filled up with thick gorse and brambles making access to the spring from the roadside effectively impossible. Approaching it from the field side we could see that the foot of the scarp had been utilised by fly tippers for the disposal of building materials in exactly the spot where the well was expected, as can be seen to the left of the picture below. 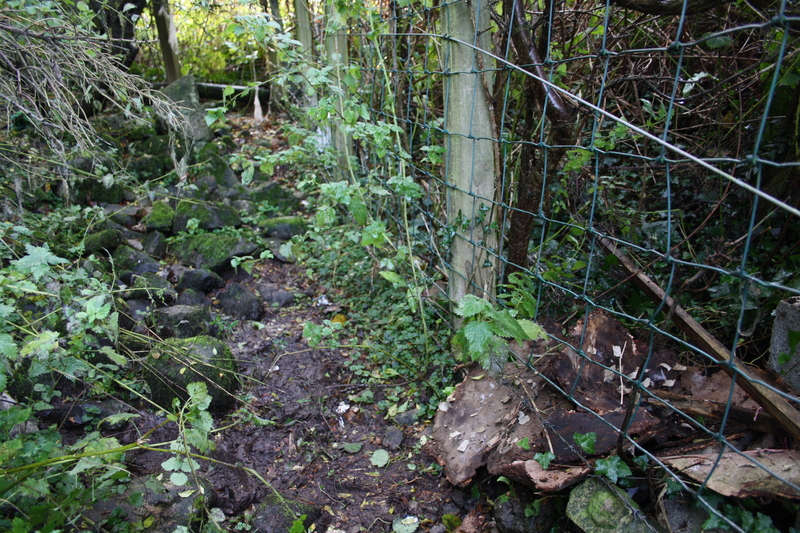 With some effort we managed to reach through gaps in the fence and remove the rubble to reveal below the grid Huws describes. The field to the east of the sump remains marshy as described. From this we conclude that Huws’ 1995 description remains accurate although through the actions of human and nature even the poor remains of the spring are now effectively inaccessible. It was reported in 2000 that the correspondent to Llygad y Ffynnon did make inquiries with the highways authority as to whether the spring could be restored in some form, but considering Howard Huws’ interpretation of the composition of the water, it is likely that this would not be particularly viable, and it is apparent now that no action was taken. In summary, as long as the road from the bypass up towards Bethel retains the name Lon Ffynnon Fair this local site name that has been recorded for at least 550 years will live on, although the reason for the name is now effectively gone. Llygad y Ffynnon. Letters to the Editor Winter 1999 and Summer 2000.